Internet business expert reveals all on a new free CD to help online retailers drive more traffic, convert traffic to buyers and get repeat customers. No more excuses for lousy online sales! The Online Store Coach™ offers a free CD to help online retailers boost sales in today's tough economy. Best practices for online retailers are finally revealed. In this interview, David Wauters, the Online Store Coach™, reveals tips, tricks, and closely-guarded secrets for increasing online sales and improving store profits. Email marketing - is it still working for retailers? Plus, for the first time, the Online Store Coach publicly reveals his favorite, closely-guarded marketing tip for retailers! (It's so simple, makes money each time and takes under five minutes to do). David Wauters states, "Online retailers who are not satisfied with their current results need to ask themselves what they are doing differently now than before the recession. If the answer is 'nothing' or 'we've scaled back', then these businesses will continue to struggle (in any economy). This new economy requires online businesses to implement best practices in marketing their online store. Luckily, what works for online retailers is already known." David Wauters adds, "Now is not the time to cut back on internet marketing efforts. Rather, online retailers should implement proven marketing systems to attract new customers profitably and retain current customers. By doing this, online businesses can enjoy an on-going, strategic, competitive advantage in any economy." Selling online doesn't have to be a mystery! 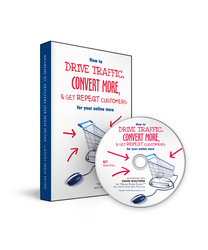 Get the free CD entitled "How to Drive Traffic, Convert More, & Get Repeat Customers for Your Online Store". Online retailers will learn how to attract new customers and keep them coming back for life. David Wauters has helped sell over $100 million online since 1997. He is a well-known, trusted online store and ecommerce marketing expert. David is known as "The Secret Weapon of Online Retailers." He has built his reputation for practical, down-to-earth advice on "what works" for effective online marketing and running a profitable Internet business. On his website, OnlineStoreCoach.com, David offers products and services for online retailers. Services include strategic consultations, site audits and on-going coaching. To order your free CD, How to Drive Traffic, Convert More, & Get Repeat Customers for Your Online Store, go to http://www.onlinestorecoach.com/freecd . For media inquiries, please visit http://www.onlinestorecoach.com/media for access to more information about the Online Store Coach™.